The picture below is a simplified diagram of the modern schools of economics. One will have to open it in a new window to see it properly. Economics is a discipline in which there are many different competing economic theories, and most of these theories are not just inconsistent on minor issues, but fundamentally contradictory in terms of their major and most fundamental theories. It follows as a matter of straightforward logic that many competing theories that contradict one another in fundamental ways cannot all be true, and that a great deal of them – that is, theories that are mutually incompatible – are likely to be wrong. 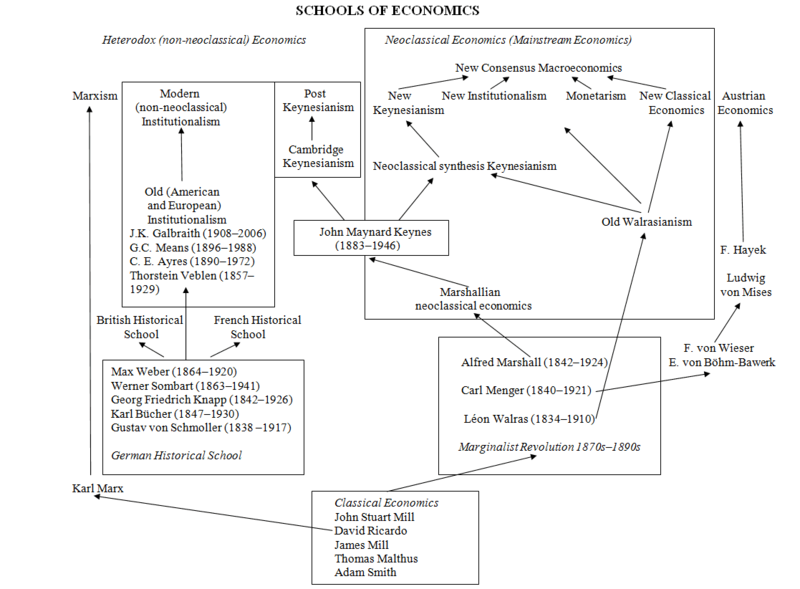 Modern economics begins with Adam Smith and the Classical School, which had two offshoots: (1) Marxism (which in many ways is a development of the thought of David Ricardo) and (2) neoclassical economics. Around the 1870s, Classical theory was fundamentally reformulated and changed in the so-called marginalist revolution, the great figures of which were Alfred Marshall (1842–1924), Carl Menger (1840–1921), and Léon Walras (1834–1910). Walras and Marshall stand out as the founders of two main neoclassical traditions. Austrian economics is an offshoot of the work of Carl Menger. The alternative neoclassical tradition that stems from Alfred Marshall leads to probably the most important economist of the past 100 hundred years: John Maynard Keynes. Keynes began his career as a Marshallian neoclassical economist but by the time of his fundamental work the General Theory of Employment, Interest and Money (1936) Keynes had essentially repudiated the neoclassical paradigm (though admittedly not completely). Important historical rivals to neoclassical economics are the German Historical School and the Old Institutionalist tradition. The German Historical School was a major rival of both Classical and neoclassical economics, and it rise to both English and French offshoots but also fundamentally to the Old (American and European) Institutionalist tradition, which by the early 20th century had come to replace the German Historical School as the fundamental competitor to neoclassical economics. Of course, one must realise that the Old Institutionalists did not all repudiate the neoclassical tradition, and many of them followed the Marshallian neoclassical tradition (Hodgson 2003: 463). Despite this, the Old Institutionalist school had impressive and considerable accomplishments: for example, the early work on administered prices/cost-based prices was done by Gardiner Means, an Old Institutionalist. A further offshoot of Old Institutionalism was the primitivist/substantivist tradition in ancient economics, the leading figures of which were Karl Polanyi (1886–1964) and Moses I. Finley (1912–1986). Moses Finley wrote a highly influential book on the economies of ancient Greece and Rome called The Ancient Economy (1973; rev. edn. 1999), which rejects many aspects of modern neoclassical economics and is firmly in the Old Institutionalist tradition (although some of Finley’s more extreme views are no longer held even by modern Institutionalists). 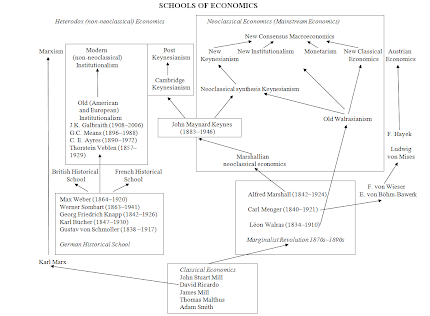 Today modern non-neoclassical Institutionalist economics continues to be an alternative to the mainstream neoclassical tradition, but it is the Post Keynesian school that arguably has done most to advance economics in the non-neoclassical tradition of John Maynard Keynes. “Non-Neoclassical Institutionalism: A List of Economists,” March 13, 2014. Davidson, P. 2005. “The Post Keynesian School,” in B. Snowdon and H. R. Vane (eds. ), Modern Macroeconomics: Its Origins, Development and Current State. Edward Elgar, Cheltenham. 451–473. Hodgson, Geoffrey M. 2001. How Economics Forgot History: The Problem of Historical Specificity in Social Science. Routledge, London and New York. Samuels, Warren J. (ed.). 2003. A Companion to the History of Economic Thought. Blackwell, Malden, MA. Institutionalist schools could get a little difficult to draw. Galbraith the elder, for example, was something of a Keynesian Institutionalist. The New Economic Sociologists like Granovetter and Swedburg have a lot in common with the Old Institutionalists but are most directly influenced by Polanyi. New Institutuonalists from Douglass North on to Ostrom on to Acemoglu are Institutionalists in realm of study, be Neoclassicals in their tool kits. Or that's my very amateur, autodidactic understanding. You must tie Marx to the Post-Keynesian school. I'm not big on Marx, as everyone knows. But Kalecki derived his formula of effective demand from the reproduction schemas in Volume II. Most of Robinson's work -- and thus the PK work on capital -- cannot be understood without taking into account Marx's influence. Also Sraffa is missing. If you want to include the Sraffians in the PK school then you have to link Ricardo to PK too. Otherwise you have to have a Sraffian offshoot from the Cambridge Keynesians which is connected to Marx and Ricardo. Yes, these are all insightful points. I would have tried to put some more of the complicated relations in the diagram of heterodox economics, but there was only so much I could fit onto a A4 sized Word document, with all the neoclassical groups. I might try and do a complex diagram focusing only on heterodox groups tomorrow, since I long wanted to attempt a proper chart. There was also a really extensive family tree of all the British economists in the post-war era. I can't find it though. I noticed you failed to include the the American School as a forerunner to the German historical school. Why does everyone forget about the American School and German Historical School connections via Friedrich List? I believe it is because the Americans were protectionists and the modern economist has never read or will not even consider the arguments from anything branded "protectionist." It's worse than being called a Nazi to the economist.